The beauty industry has an ugly secret. 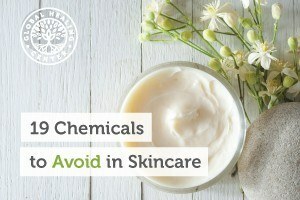 Most skin care products–both regular and “organic”–contain harmful chemicals. When it comes to cosmetics, no one regulates what “organic” or “natural” means. Your makeup, face cream, skin moisturizer, or cleanser may deliver short term smoothness and brightness, but it may disrupt your hormone and fertility, expose you to known cancer-causing pesticides, and deliver dangerous toxins that penetrate and age your skin. That’s right. The cosmetics you use may actually speed the formation of wrinkles, age spots, and worse. In the US, researchers have found 1 of every 8 ingredients used in cosmetics is an industrial chemical. Many of these were originally created to keep concrete soft, remove grease from auto parts, and as surfactants paints and inks. To protect your skin and keep it looking young, firm, and bright, look for these chemicals in all skin care products–and avoid them. A common ingredient in “fragrances”, phthalates block testosterone and damage a man’s reproductive system. These dangerous chemicals have also been linked to an increased risk of breast cancer. You’ll find this one in most shampoos, soaps, and cleansers. It may contain 1,4-dioxane, a known carcinogen, and ethylene oxide, a chemical known to harm your nervous system. The California EPA has even identified it as a possible developmental toxin. Used in dandruff shampoos, these ingredients wreak havoc when rinsed down the drain and into nature. Researchers report that one fungicide, climbazole, kills tiny organisms like algae and stops growth in larger plants and fish. Even though the cosmetic industry is largely unregulated, with a few mindful steps, you can protect, heal and restore your skin. Many natural products including olive oil, coffee berry, and green tea can treat and prevent premature aging of your skin from UV exposure. Here’s what to do… First, don’t buy or use any cosmetic product, cream, sunscreen, ointment, or lotion that has any of the ingredients listed above. This may take a little work, but you and your family will be far better off in the long run.